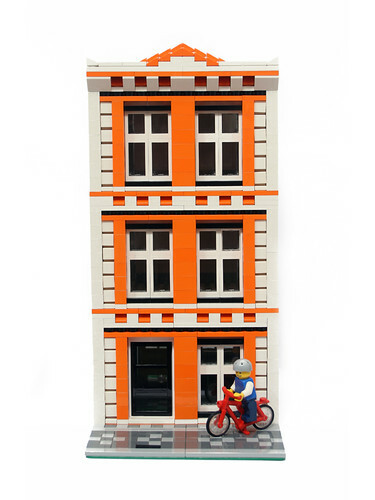 Brick Town Talk: Edificio - LEGO Town, Architecture, Building Tips, Inspiration Ideas, and more! Bright orange is hard to use in LEGO structures. Sometimes it's just too over- powering and the color just takes away from the model as a whole. However, this building by Naneto, a Portuguese AFOL, is certainly an exception. By blending it with the white bricks and the black outlines created by the windows, the orange enhances the building's look and contributes to a very pleasing aesthetic design. Good work!